Meghan, Duchess of Sussex is an American actress, model, and humanitarian. She was previously known as Meghan Markle. Duchess Meghan is the daughter of Doria Loyce (Ragland) and Thomas Wayne Markle, a lighting director who worked on Married… with Children. She is married to Prince Harry, Duke of Sussex. Her father is white and her mother is black. A picture of Duchess Meghan with her father can be seen here. 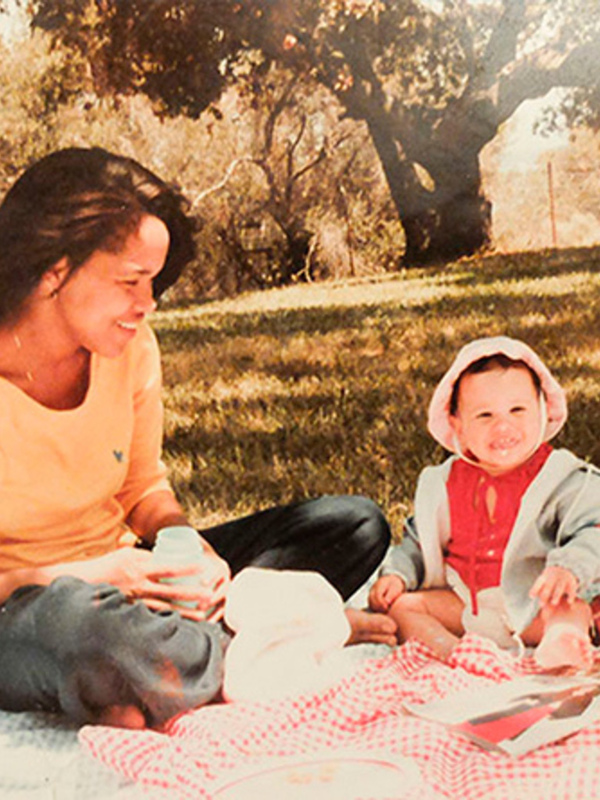 Pictures of Duchess Meghan with her mother can be seen here and here. More pictures of her family, specifically her mother’s side, can be seen here. My mom is black and my dad is Dutch and Irish, so the texture of my hair is densely curly. I’ve been getting Brazilian blowouts for a couple of years. Duchess Meghan’s Dutch ancestry is really Pennsylvania Dutch, the name for ethnic Germans who lived in Pennsylvania; her German ancestry includes Alsatian Germans. Her father also has a preponderance of English ancestry, with Colonial American roots going back to the 1600s, as well as some Irish, Scottish, and Scots-Irish/Northern Irish, and remote French, ancestry. Duchess Meghan and her husband Harry share a common ancestor in the 1500s; the details of this remote genealogical relation can be seen here. Duchess Meghan’s maternal grandparents were/are both black, from African-American families. I took an African-American studies class at Northwestern (university) where we explored colourism; it was the first time I could put a name to feeling too light in the black community, too mixed in the white community… For castings, I was labelled ‘ethnically ambiguous’. Was I Latina? Sephardic (Jewish)? Exotic Caucasian? Several web sites have stated that Duchess Meghan’s father is Jewish. This is not accurate. While her wedding to her first husband, producer Trevor Engelson, was Jewish or had Jewish elements, that is because Trevor is Jewish. It is possible that Duchess Meghan converted to Trevor’s faith, but there is no particular indication of this being the case. She joined the Church of England upon marrying Prince Harry. 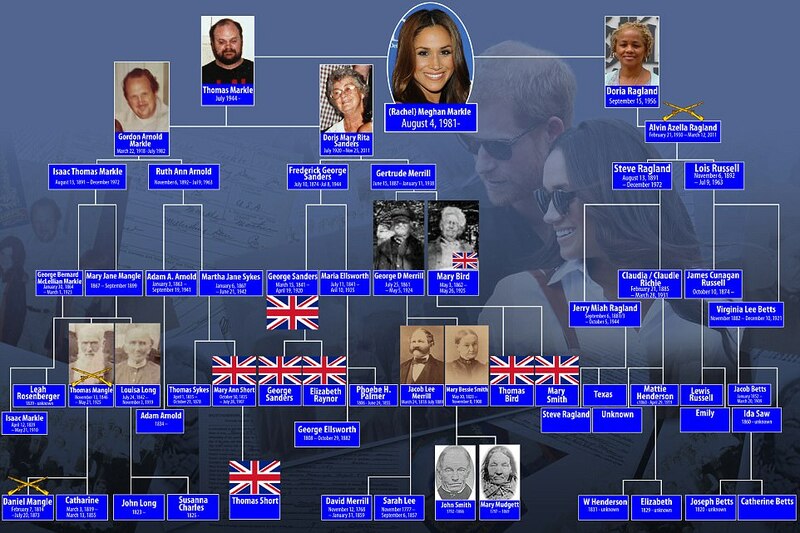 Duchess Meghan’s paternal grandfather was Gordon Arnold Markel/Markle (the son of Isaac Thomas Markel/Markle and Ruth Ann Arnold). Gordon was born in Pennsylvania. 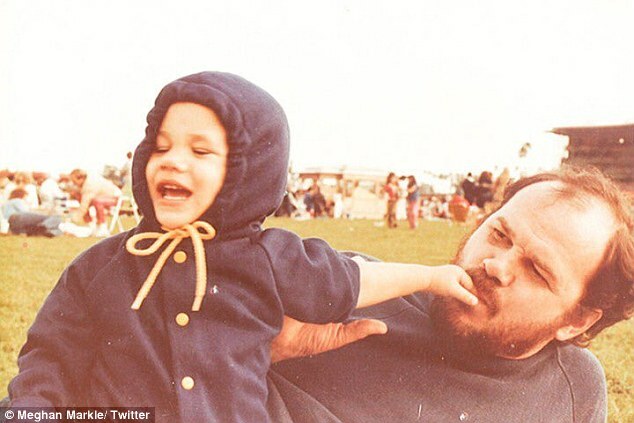 Isaac was the son of George Benjamin McClellian Markle and Mary Jane Mangle/Mengle. Ruth was the daughter of Adam A. Arnold and Martha Jane “Mattie” Sykes. 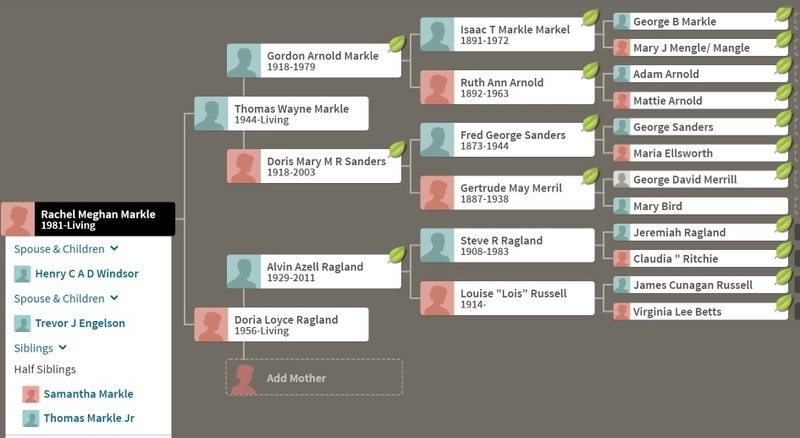 Duchess Meghan’s paternal grandmother was Doris Mary/May Rita Sanders (the daughter of Frederick/Fred George Sanders and Gertrude May Merrill). Doris was born in New Hampshire. Frederick was the son of George Sanders and Maria Belle Ellsworth. Gertrude was the daughter of George David Merrill and Mary Bird, who was born in Malta, to an English father and an Irish mother. Her family moved to Canada. Duchess Meghan’s maternal grandfather was Alvin Azell/Azella Ragland (the son of Steven/Steve R. Ragland and Louise “Lois” Russell). Alvin was born in Tennessee, and was African-American. Steven was the son of Jeremiah/Jerrymiah/Jerry Miah Ragland and Claudie/Claudia Ritchie/Richie. Lois was the daughter of James Cunagan Russell and Virginia Lee Betts/Bettes. Duchess Meghan’s maternal grandmother was Jeanette Arnold (the daughter of James Arnold and Netty/Nettie Mae Allen). Jeanette was born in Ohio, and was African-American. Nettie was the daughter of Luther Hunter Allen and Gertrude Parks. You are mean, shes not stunning, but not so ugly, she’s only really short, I’ll bet she’s not over 5.5– Only The Queen is shorter than her, in the Royal family.… I don’t like short people too, with the exeption of Queen Elizabeth., of course. BTW I guess that in is Youth the Queen ws average for a woman…and sure, she was stunning, Ilve to watch her coronation…cause she’s really beautiful. but she lost a lot of cm.. with old age. BRw Lady diana even if she was a tall woman, was averagetoo… she got a really big nose..